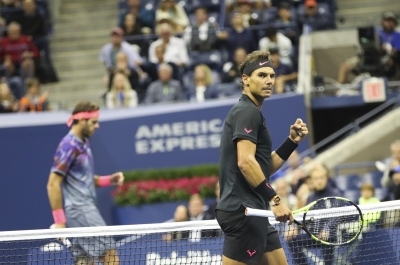 New York, Sep 9 (IANS) Spanish star Rafael Nadal qualified for the men’s singles final at the US Open tennis tournament with a hard fought victory over Juan Martin del Potro of Argentina here. The current World No.1 had to fight hard before winning 4-6, 6-0, 6-3, 6-2 in a semi-final match that lasted for two hours and 31 minutes here on Friday evening, reports Efe news agency. Nadal will face Kevin Anderson of South Africa in the final. Kevin had beaten Spain’s Pablo Carreno 4-6, 7-5, 6-3, 6-4 in the other semi-final. This is the 23rd Grand Final of Nadal’s career. He has won a total of 15 Grand Slam titles, including two at the US Open. The 31-year-old has reached the US Open final on three previous occasions, meeting Serbian star Novak Djokovic in all three title showdowns. Nadal emerged triumphant in 2010 and 2013 while losing to Djokovic 6-2, 6-4, 6-7(3-7), 6-1 in the final of the 2011 edition. In a brief statement on court at the end of the match, Nadal acknowledged that in the first set he was playing too much against the backhand of Del Potro. “I knew something had to change,” he added. Nadal stressed the importance of reaching the final of the last Grand Slam of the season, which he considers the most important match of the season.